Powers/Abilities: Louis Stark was a wealthy inventive genius (see comments). Although described as "a big man, and tough" (per Grebbs), the husky Stark was a normal human with no paranormal physical abilities; he wore eye-glasses. Stark created a "time-viewer," which he hoped to use to alter the actions of tyrants of the past and bring about world peace. 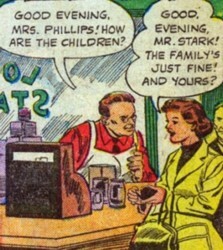 While using the apparatus, Stark tampered with the life of an individual who happened to be one of his ancestors, and thus Louis Stark's entire life was retroactively altered by the temporal chain-reaction--in the resulting reconstituted reality, Stark was simply the owner of a grocery store instead. 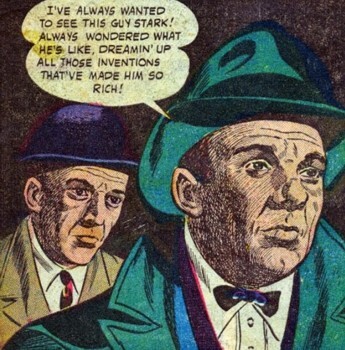 (Uncanny Tales I#50/1 (fb) - BTS) - The past of Louis Stark is largely unrevealed, but he had acquired a great deal of wealth from his inventions. For two years, Stark employed Henry Grebbs as his butler, but Grebbs eventually left that position--during his employment, Grebbs learned that Stark kept a large sum of money in his cellar vault. At some point in his cellar lab, Stark began building the most ambitious invention ever to come from his brilliant mind--his "time-viewer"; he planned to use the device to alter the past and bring about world peace. (Uncanny Tales I#50/1) - Late one night, Stark completed the "time-viewer" and was preparing to test it. 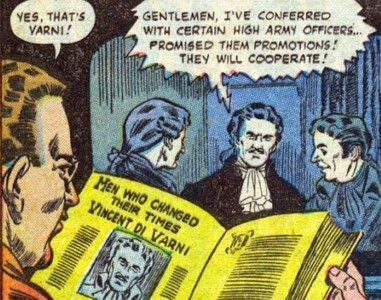 He first consulted a history book concerning the infamous 18th Century conniver Vincent Di Varni; Stark read of how Di Varni had instigated a plot to overthrow a European king and turned the monarch into his puppet. Having decided to begin his mission by stopping Di Varni's revolt, Stark activated the "time-viewer" and adjusted it to the year 1761, then he watched the events as Di Varni planned his rebellion--unknown to Stark, at that very moment, Henry Grebbs and Dave Lawlor were breaking into his home in an attempt to rob him. 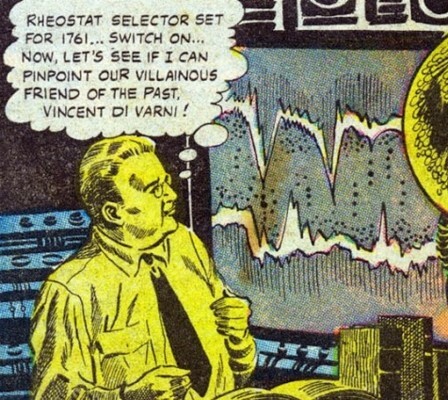 Stark continued to watch the historical events of Di Varni's plot unfold on his "time-viewer," and at a crucial point in the rebellion, Stark used his machine to send "electronic rays" back through time to immobilize Di Varni--Stark had changed the course of one nation's history, for Vincent Di Varni's coup d'etat failed and he was captured. But Stark had done no real harm to Di Varni's life, for in his altering of history, Di Varni was exiled to England, where he had married a lovely woman and eventually had a daughter--Stark was pleased because Di Varni was now happier than he otherwise would have been. 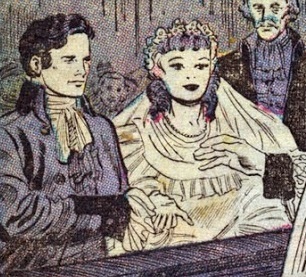 Curious as to how his altering of the past would affect the life of Di Varni's daughter, Stark adjusted the "time-viewer" ahead by twenty years, and he saw Roxanne Di Varni--she was now having a formal wedding ceremony rather than eloping, as history had originally recorded. Stark thought it would be interesting to see the consequential alterations in the lives of other family members, so he continued to use his amazing machine to watch the changes in further generations of Di Varni descendants--he found that none of them had really been harmed, because mostly they just had different occupations and personalities. 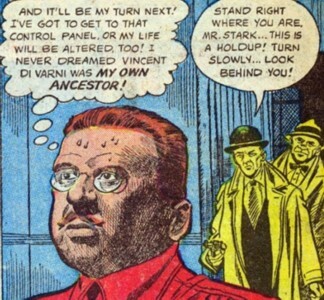 Then Stark adjusted the controls to display events from more recent times, and in the year 1910, Stark saw a Di Varni descendant he recognized--it was Stark's own father! 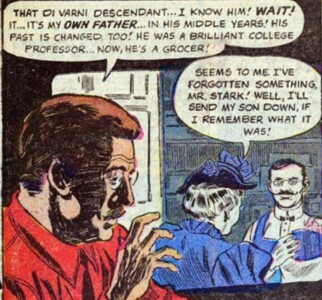 But the life of Stark's father (who had been a brilliant college professor) had been changed as well, for now he was just a simple grocer in the altered timeline! 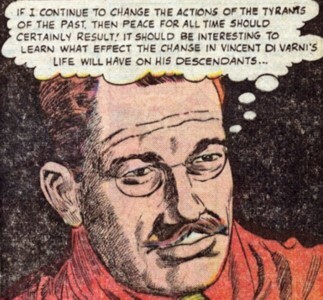 At that point, Stark realized that Vincent Di Varni had been his own ancestor, and by altering Di Varni's life, the cascading chain-reaction would soon catch up with Stark himself and change his life! Stark attempted to reach the control panel to prevent the temporal domino-effect from reaching him; but suddenly Grebbs and Lawlor burst into Stark's laboratory and demanded his money at gunpoint. The distraction caused by the two burglars kept Stark from reaching the "time-viewer's" controls; as time and change wrought by his own invention caught up with him, Louis Stark faded away. With the altering of reality, Louis Stark's past was now gone, for it had never existed, because with the resetting of the timeline, Louis Stark now owned the grocery store his father had started--he had expanded the business, and he was very happy. And in that instant of change, all trace of memory of inventor Louis Stark was obliterated as well--even the big home he had built was no more! All that remained in an empty lot (which had previously contained Stark's home) were two very confused would-be burglars, who had no idea why they were standing in an empty lot at such a late hour. Comments: Created by Carl Wessler (writer) and Joe Orlando (artist). 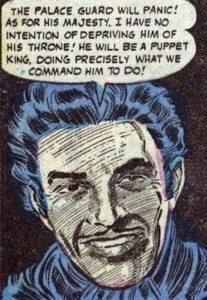 Hmm... a mustachioed wealthy inventor named Stark... Now where have I heard that before? The specific name of Stark's invention was never mentioned, so I just called it a "time-viewer". Although this was the cover-story of this issue, the scene depicted on the cover really didn't match the story. This 4-page story--Look Behind You!--kind of reminds me of cross between the old movie It's a Wonderful Life and Ray Bradbury's story A Sound of Thunder. Thaddeus Stark, futuristic Iron Man @ Marvel Universe Millennial Visions 2001 - "Avengers: Assembled Once More"
A large house built like a fortress, it was where inventor Louis Stark lived. In the cellar was Stark's laboratory, as well as a vault in which Stark kept a large sum of cash. During Stark's use of his "time-viewer," he unintentionally altered his own personal reality, and Stark's home faded from existence, leaving only an empty lot. Built by Louis Stark in his cellar laboratory, the "time-viewer" could somehow "tune in" to past events and display the images on a video screen; additionally, it could also receive sounds from the past. The "time-viewer" could also transmit immobilizing "electronic rays" back through time. Stark hoped to use the "time-viewer" to alter the actions of tyrants of the past, and thus bring about world peace. But when he changed events in the life of 18th Century usurper Vincent Di Varni, Stark unintentionally changed his own life as well, because Di Varni had been his ancestor. A skilled swordsman with a fencing epee, Di Varni had lived in 18th Century Europe. In 1761, he orchestrated a plot to overthrow the king of an unspecified European country and turned the monarch into his puppet ruler; the conniver's name would be recorded in history books for his act of infamy. But Di Varni's life was changed when inventor Louis Stark used his "time-viewer" to send "electronic rays" through time to immobilize Di Varni during his attempted revolt; because of this history-altering event, Di Varni was instead exiled to England, where he met and married the lovely Deborah Stevens, and the couple eventually had a daughter--Roxanne; as a result, Di Varni was happier than he would have been otherwise. But as fate would have it, Di Varni had been an ancestor of Louis Stark, and the ramifications of changing Di Varni's life would eventually alter the lives of all of his descendants, including Louis Stark himself. The daughter of Vincent Di Varni, originally she had eloped with an Englishman (circa 1781). But in the reconstituted reality caused by Louis Stark altering the life of her father, Roxanne instead had a formal wedding to the Englishman. A descendant of Vincent Di Varni, and the father of Louis Stark, he had originally been a brilliant college professor. When Louis used his "time-viewer" to alter the life of Vincent Di Varni, reality was changed, and in 1910, Mr. Stark was instead a simple grocer. Grebbs had been employed as Louis Stark's butler for two years, but eventually left that position. 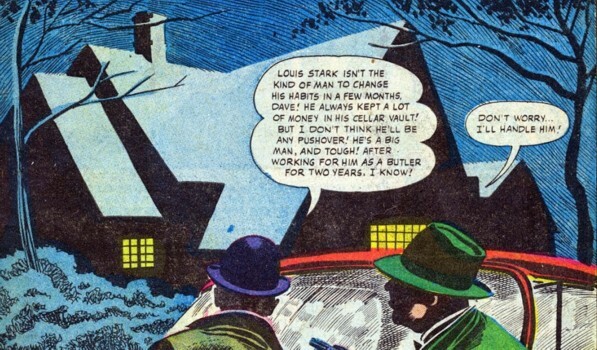 Having learned that Stark kept a large sum of cash in his cellar vault, Grebbs partnered with Lawlor, and the two were going to burglarize the home of Stark. Grebbs and Lawlor broke into Stark's home and went down to his cellar lab. 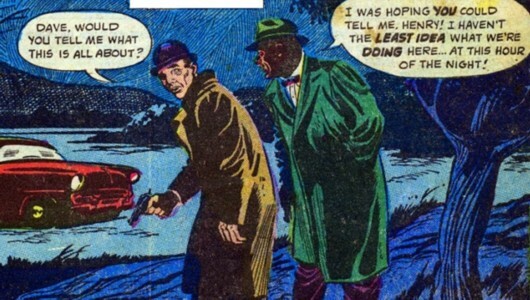 As they threatened Stark at gunpoint, Grebbs and Lawlor were unaware that Stark had altered the past of one of his ancestors while using his "time-viewer"; the distraction caused by the two burglars kept Stark from preventing the reality-altering cascade from reaching him, and wealthy inventor Louis Stark--along with his home and all memory of his existence--faded away. After reality was altered, the two confused burglars were left wondering why they were standing in an empty lot at such a late hour.